Como city, Cernobbio, Famous Villas (ex. 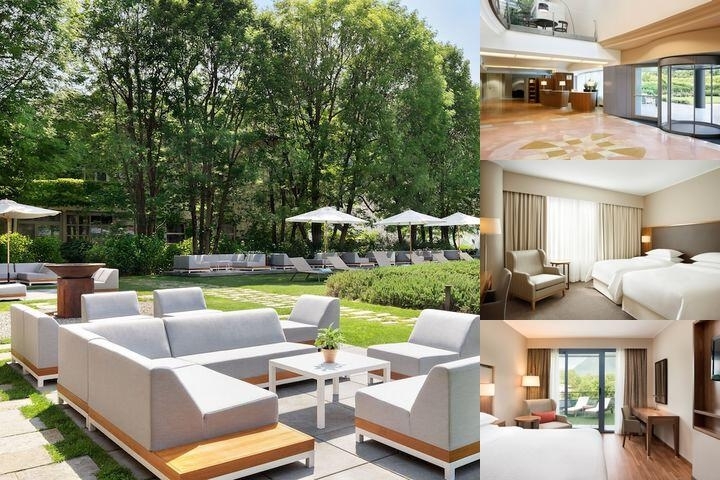 Villa del Balbianello), Lugano, Fox Town (Switzerland), Tennis Court, Golf Course, Beach at Lido VIlla Olmo. Como is easy to reach by plane arriving at the three airports in Milan (Malpensa, Linate and Orio al Serio) and the one in Lugano Switzerland. In addition fast and frequent trains connect Como to Milano and Switzerland daily. 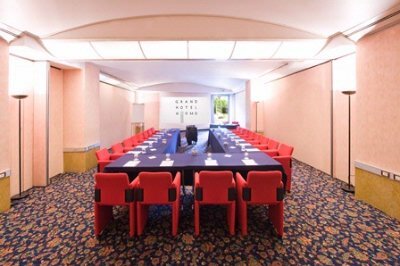 The Grand Hotel di Como resides in a strategic position between Como and Cernobbio and few minutes driving from the freeway exit Como North, the Swiss border and the Convention Centre of Villa Erba.The Grand Hotel di Como has 153 rooms: Classic, Prestige, De Luxe and Suites. Rooms are enriched by beautiful reproductions of famous pictures by Gauguin, Monet and Botticelli on precious silk canvas. Each offering wireless Internet access, Sky TV, adjustable air-conditioning/heating, king-size bed, marble bathroom with shower or bathtub, and specialty amenities.The double rooms (with king-size bed or twin beds) have a sofa, while 8 Classic are specifically equipped for the physically challenged. Leave the entrance hall and take the wide marble stairs leading to the cosy living room of the Monet Grand Café with its art books, newspapers, magazines and soft, background music. The Botticelli Restaurant offers Mediterranean and local cuisine accompanied by the finest wines at reasonable prices.Here you won't find any anonymous international dishes on offer. Moreover, In the amazing setting of its park, the Grand Hotel di Como is pleased to introduce a new and unique-of-a-kind restaurants:Kitchen, the exclusive restaurant for a special dinner, proposes you an innovative gastronomic experience in a sophisticated atmosphere and Kincho, informal and relaxing, is ideal for a break, a lunch or a dinner with a difference: grill, pizza and an open-air gazebo surrounded by the flowers and the greenery of the park.The hotel is the ideal location to host different kind of events, such as conventions, congresses, concerts, shows, fashion shows, trade fairs, car launches, art exhibitions and banquets thanks to: 10 multifunctional rooms on the ground floor, banqueting space on the 1st floor, the new auditorium Spazio Como.The modern Congress Centre can meet any type of demand: from the small meeting to the symposium, from the training course to the big congress, thanks to its 10 multifunction rooms, some with daylight. Wi-Fi Internet Connection, audiovisual equipment and technical assistance are also available for the perfect outcome of any event, while the Welcome Desk, located in the lobby, is specifically equipped for registration and has direct access to the rooms.The brand new auditorium “Spazio Como”, a state of the art multi choice space, completes the offer. 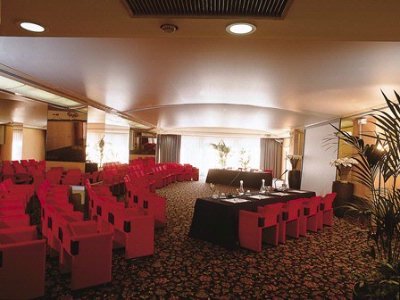 With a surface of 400 sq mt, a maximum height of 5,50 mt and provided with the most advanced audiovisual equipment, the conference room has been designed for flexible set up: up 300 people for theatre style, 150 people with school style, 200 cabaret style, 150 people with theatre plus exhibition stands.The central stage can also be used to host music events or theatre plays and art performances, fashion shows, banquets and functions up to 350 participants, trade fairs and art exhibitions with stands, reception in the lobby and possibility of adding stands of big size. To begin the day as you mean to go on, breakfast sets the tone at the Grand Hotel di Como. Created by Italo-Dutch food designer Maddalena Prini, the buffet is based on a series of delicious themes. Tuttifrutti: juices, whole fruits and pieces; Cereali +: milk, yoghurt, cereals, mousse, semi and dried fruit; Piccolo Forno: oven warm bread, croissants, jams and marmalades; Rituale del Tè: freshly baked cakes; Tavola Fredda: local charcuterie and cheeses to enjoy with honey and jams; Pronto al Momento: with a chef on standby to prepare your eggs just as you like them; Richieste Speciali: bio, low calorie and gluten-free products for guests with special dietary needs. A full, tasty Italian breakfast offering a wealth of choice. 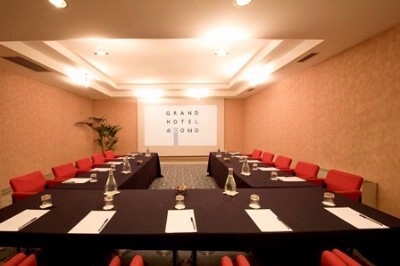 Below are the meeting, banquet, conference and event spaces at Grand Hotel Di Como. 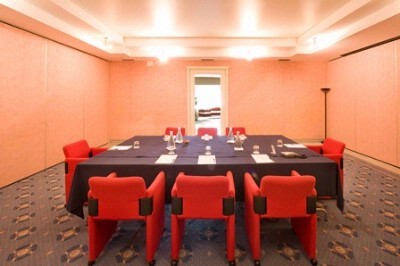 Feel free to use the Grand Hotel Di Como meeting space capacities chart below to help in your event planning. 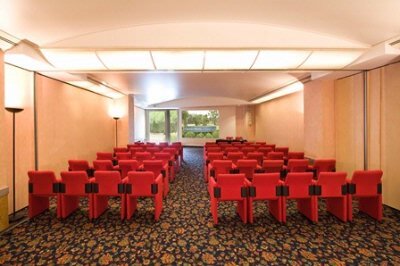 Hotel Planner specializes in Como event planning for sleeping rooms and meeting space for corporate events, weddings, parties, conventions, negotiated rates and trade shows. 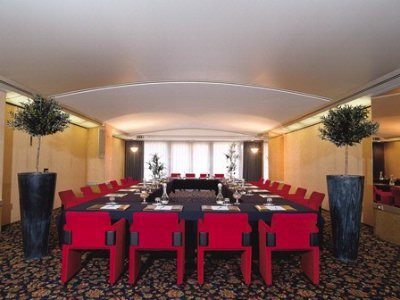 The new futuristic auditorium SPAZIO COMO, completes the meeting offer of the hotel. 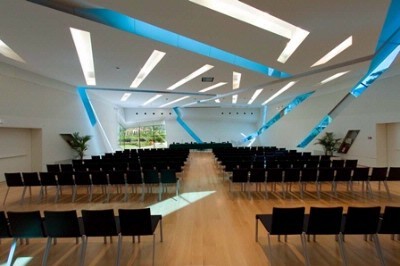 With a surface of 400 sq mt, a maximum height of 5,50 mt and provided with the most advanced audiovisual equipment, the conference room has been designed for flexible set up: up 300 people for theatre style, 150 people with school style, 200 cabaret style, 150 people with theatre plus exhibition stands. The central stage can also be used to host music events or theatre plays and art performances, fashion shows, banquets and functions up to 350 participants, trade fairs and art exhibitions with stands, reception in the lobby and possibility of adding stands of big size. 25 x 16 x 5 M.
18 x 16 x 3 M.
18 x 8 x 3 M.
17 x 8 x 3 M.
18 x 46 x 3 M.